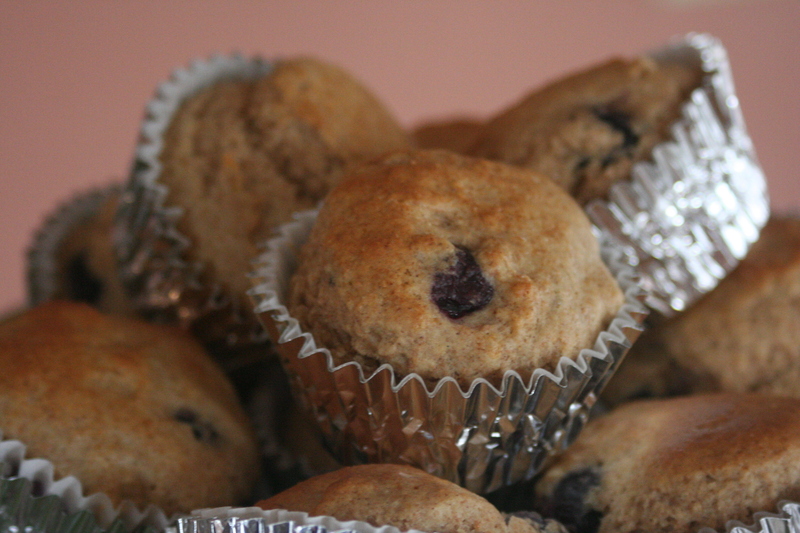 We really enjoy having muffins around! They are wonderful as a side dish, for breakfast or brunch, or even for an afternoon snack. My husband loves blueberries, so these are a favorite. I pick and freeze the blueberries in the summer and we eat them all year round. Delicious! I often make a double batch so we can have them for several days. In a med. bowl combine flours, sugar, baking powder, cinnamon, and salt. Make a well in center of dry mixture; set aside. In another mixing bowl combine egg, milk, vanilla and oil. Add mixture all at once to the dry mixture - stir just until moistened. Fold in blueberries - do not overmix. Spoon batter into greased or lined muffin pan filling 2/3 full (I use an icecream scoop). Bake at 400 degrees F for 20 min. or until golden. Makes 10-12 muffins.